Cells come with stereotypical shapes and sizes which are often associated with their function. Neurons grow in highly elongated morphologies to build neuronal networks, while red blood cells have discoid-like deformable morphologies to squeeze within tiny blood vessels. Questions that fascinate our team are to understand how cells define their particular shape, and how information in cell geometry may be conveyed into cell function or in organizing the cell interior. To address these fundamental questions, we integrate original methods at the frontier between molecular biology, genetics and physics and mathematics. One of our ultimate goal is to capture biological behavior with mathematical models. The proper positioning of the site of cell division is crucial not only for the survival of all cells, but also for the development of multi-cellular tissues. The lab is fascinated by the process of early embryogenesis during which the egg becomes fertilized and follows a stereotypical choreography of successive division, called cleavage patterns. Our goal is to understand, predict and establish quantitative laws that explain the patterning of cell divisions in early embryos. To this end, we combine mathematical modelling, imaging and biophysics approaches. 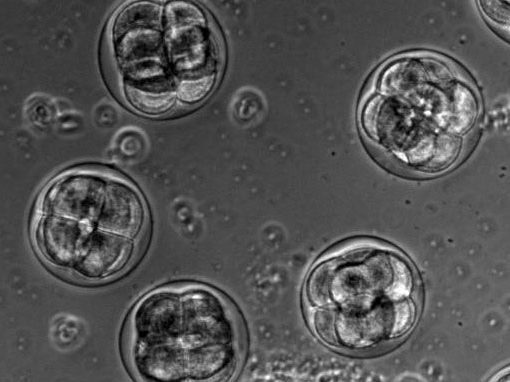 Our model experimental system is the sea urchin embryo, which integrates many advantages for the study of early development. To extend our findings to other multicellular context, we also have collaboration with other labs, working on flies, frogs, fishes and ascidians. Tanimoto H, Kimura A, Minc N (2016) “Shape-motion relationships of centering microtubule asters” J Cell Biol 212 (7): 777. 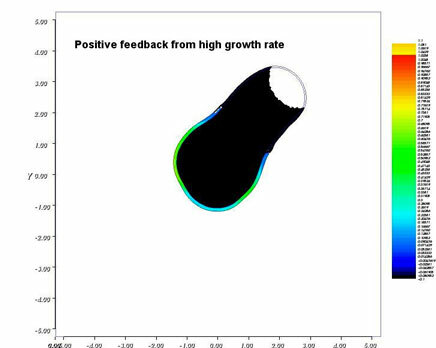 Minc N. and Piel M. (2012) ,”Predicting division plane position and orientation” Trends Cell Biol., 22(4). 193-200. Minc N. , Burgess, D. and Chang F. (2011), “Influence of cell geometry on division plane positioning” Cell., 144 (3): 414-426. The morphology of single cells as well as cells embedded in tissues underlie many of their function. We seek to address how cells develop their particular shape and internal organization. 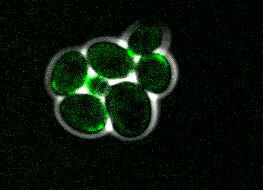 For instance, many cells only grow at a given location, a process called polarized growth, which involves specific biochemical reactions needed to cluster a local domain of growth activity. 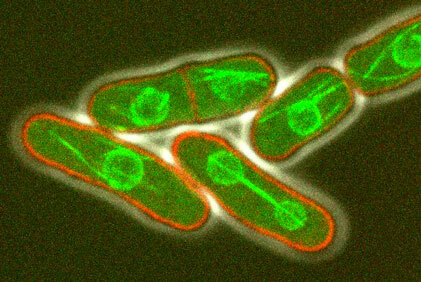 To study these aspects we use a unicellular fungi called fission yeast. These cells have rod-shapes and are genetically tractable, with many mutants defective in morphogenesis. 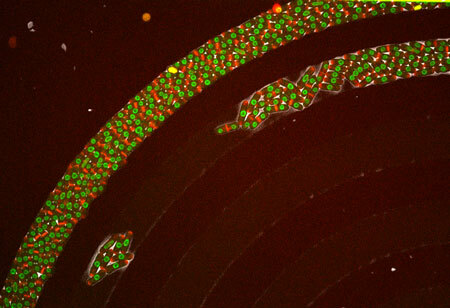 These cells are encased in a stiff cell wall and are turgid, which provides them with particular mechanical properties. One of our ultimate goal is to link biochemical and biomechanical signals which serve to shape cells. Haupt A, Minc N. (2017) “Gradients of phosphatidylserine contribute to plasma membrane charge localization and cell polarity in fission yeast.” Mol Biol Cell. 28(1):210-220. Bonazzi D, Haupt A, Tanimoto H, Delacourt D, Salort D, Minc N, (2015) “Actin-based transport adpapts polarity domain size to local cellular curvature” Curr Biol 25(20):2677-83. Haupt A, Campetelli A, Bonazzi D, Piel M, Chang F, Minc N, (2014) “Electrochemical Regulation of Budding Yeast Polarity”. Plos Biology ;12(12):e1002029. We here share some of our basic protocoles, image analysis scripts and simple modeling tools. The packages come with scripts and a couple of example images. This simple Matlab script, developped by Nicolas Minc (Minc et al. 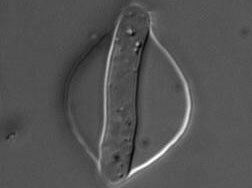 Cell 2011; Campinho et al NCB, 2013), serves to predict the direction of the cell division axis based on cell shape. It interacts with the user and uses hand contour tracing to infer cell geometry and outputs an energy landscape for spindle orientation angles. This package, developped by Dmitry Ershov and Anaëlle Pierre ( Ershov and Minc, Methods Mol Biol, 2019; Pierre et al. Dev Cell 2016), includes Matlab files, and surface evolver guidelines to predict cell division axis, in 3D , based on multiple inputs (cell shape, polarity, yolk gradients etc...). for the cleavage patterns of early embryos, or in any cellular or tissular context. This Matlab package, developped by Hirokazu Tanimoto, Dmitry Ershov and Valeria Davi (Davi et al. 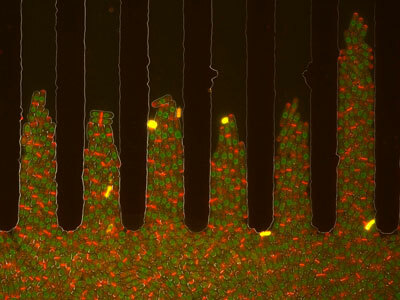 Dev Cell 2018), serves to compute cell wall thickness in live fission yeast cells from the fluoresence of a membrane marker and a lectin marking the outer part of the wall. This Matlab package, developped by Hirokazu Tanimoto and Valeria Davi (Davi et al. In revision 2019), is a second version of Wall tracker with a specific module to analyse shape changes following cell wall ablation; which serves to compute cell wall elasticity and thickness in fission yeast and other walled cells. This Matlab package, developped by Hirokazu Tanimoto (Bonazzi, Haupt, Tanimoto .Curr Biol 2015), serves to quantify polarity domain size and local cell curvature at the polarity site. It interacts with the user and uses hand contour tracing to obtain a detailed measurment of relevant parameters. This simple Matlab script, developped by Yonatan Zegman and Nicolas Minc (Zegman et al. Methods Cell Biology 2015), serves to quantify size parameter of single pombe cells. It interacts with the user and uses hand contour tracing to obtain a detailed measurement of cell volume, surface and other parameters.